Sooner than late says I...later than sooner says Husband. that Pioneer Woman shows on her site. 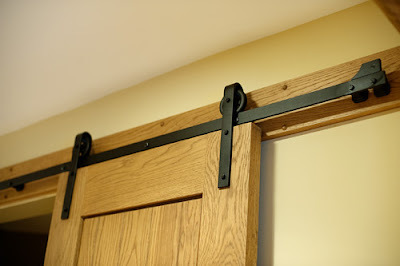 we aleady have the heavy barn doors. Think it would make a great bathroom and sleeping area door. She mentions she got hers from here. Thanks for the source PW! 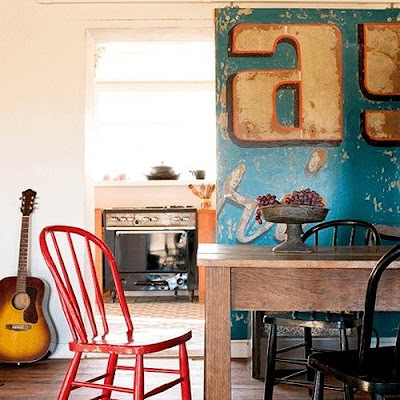 PS....Lovin' this old sign turned door with the barn door hardware! Ha ha! Loved the clam comment. I am also loving this barn idea. Beautiful pictures and ideas. Where will the horses live? I love all of these; it's gonna be hard to choose! Oh, Gorgeous...this barn has been bereft of horses for awhile. It is currently used for storage and an old workshop. It's little and Mr. Ed like. I think your barn is a FABULOUS space! Tell dear husband we all think so!! Love your inspiration photos. We are only weeks away from starting on our barn. I also saw the barn hardware on PW's site this weekend. I'm very happy to say our barn has original door hardware- kind of looks like upside down horseshoes? and we will be moving one set to a new 1/2 bath (the 'outhouse'!) and the other to a blank wall to keep it intact as it is currently the actual barn door and will become french doors/stone fireplace in the redo. Those doors are great. I would like to slide them open to sunshine and a fabulous day! Thank you. Linda- I LOVE this post AND that you have a barn too! I always thought it would be fun to live in an old barn, schoolhouse, church and this old cheese factory near us. I look forward to see your finished project. Thanks for sharing. Linda, I wonder if Jan would ever let you feature her barn redo. It's a great space, too. Lovin' all those barn sliders. Can't wait to see what you come up with. Oh I REALLY love these barn images.. especially that cool blue one!!! My dear Hubby bought me a little blue craft barn/junque shed for Christmas and I am trying to shugar it up a bit and put my stamp on it! Your post is just what I needed to get me motivated!! Shows us yours as you progress!! Yum, yum, and YUM! I love barns and converted ones are even better! The sliding doors are fab - I just saw a picture somewhere of one that used a huge vintage sign as the door, it was very cool. I'll try and find it and send it your way - I can't wait to watch this project unfold!! It will unfold s l o w l y...but is a great potential space. Joan...I'm popping over right now to see what you are up to! Cheese factory Joyce??! Pray tell?? Isa...Ooooh yes, send it when ya find it! Sandra...Oh yeah! Jan's was amazing, this will be quite a bit more modest. Linda, I would be more than happy to be the first guest to stay in the finished barn :) I hope you get to start on this project soon so we can enjoy watching the transformation in 2009! I love these idea photos you have. I have friends who moved an old barn into the Creemore Hills. It is so open and airy and massive and magnificent. I can't wait to see your finished space. Tell husband we all vote 'sooner'. O.k. I take the barn too...:) it's hard to decide, because all of the houses are so beautiful! I really love this post! Wonderful pictures, beautiful ideas, its hard to decide wich is best! So many beautiful ideas! 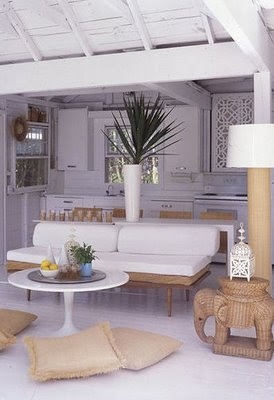 Especially love the photo with the white sofa and pale bluish walls. It's so great to visualize your dream this way. That's how they come to fruition. Dream first--clams will follow. oh my..........I want a barn. Can I convince you to share? Oh! I love the idea of a barn redone into an office/guest retreat. And *love* the sliding doors! I was just researching barn doors! Who knew that you were doing it for me. Linda, thanks for your kind words on Patti's blog too! You too have a lot in common with your incredible images and creative content-love those sliding doors, now that is a cool barn! 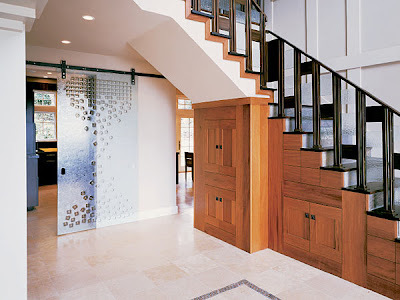 I'm doing these doors in my house too!!! I am going to be putting them on my closets in the bedrooms. I LOVE them and I love that you posted about them. Blue Muse...I LOVE that idea!! Really have my wheels turning now! One of ou neighbors had an amazing vintage orange grove sign about that size hanging in their guest cottage...I always loved (read:coveted) it! Oh...to find another! Looks like a lot of barn door searchers! I like this from Farmhouse: Dream first...Clams will follow. Indeed. 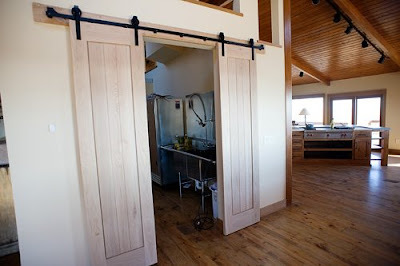 I'm in LOVE, I'm in LOVE, I'm in LOVE, I'm in LOVE with those sliding barn doors! Beautiful - I say GO FOR IT! Ooo, and I haven't forgotten about you ... I mailed out the napkin rings yesterday. I'm sorry they're so late - holidays have kept me up to my knees in bargain shopping and a trip to the post office seemed to elude me everytime! Hope you enjoy them - let me know when they get there! How fun! Whatever you decide to do with your barn, I know it will be beautiful. Beautiful barn photos...I also love the sliding doors! YOUR barn looks like it has lots of potential. I grew up with Mr. Ed (the original not the reruns!) Dutch doors are so cottage..I think it could be really cute...just get out your white paint! Just found your site via Canyon Wren Cottage. Happy New Year! I hear you about the clams, but dayum girl, just to HAVE a barn to dream about would be fan-freakin-tabulous! I think I want to live in your BARN!